The three principal cemeteries in Paris - Père Lachaise, Montmartre and Montparnasse - see large numbers of tombstone tourists, but few people venture out to the other smaller burial grounds in the city. A look in photos at one of these, the cimetière de la Villette. 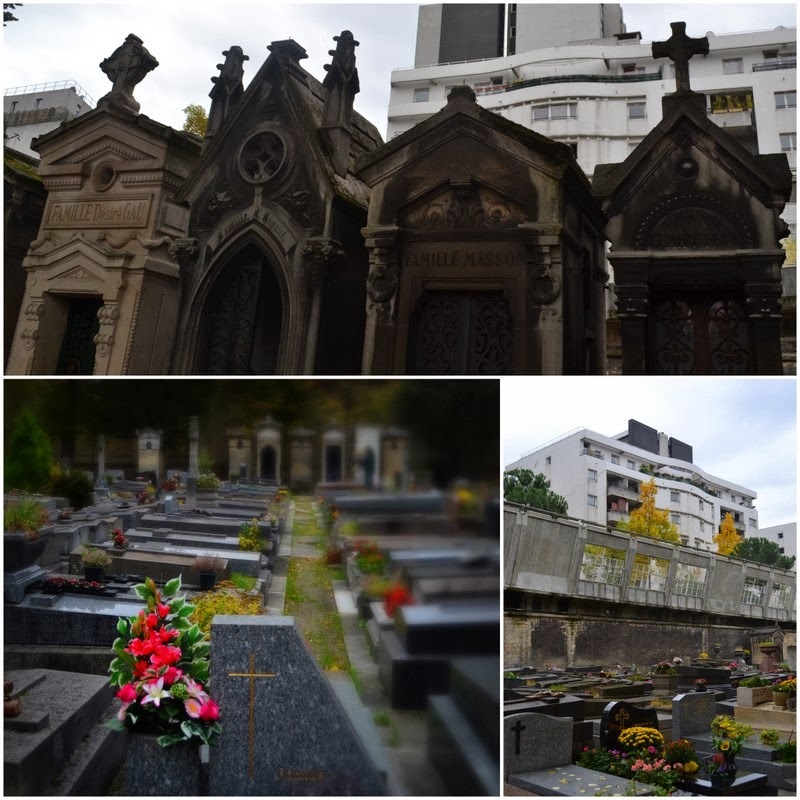 Like the majority of cemeteries in Paris, the La Villette graveyard was originally created to serve the needs of a small village community on the outskirts of Paris. The cemetery we see today is actually the fourth one in this particular village, the growing suburb having quickly filled the other three (which were all abandoned then built over). The La Villette cemetery is not picturesque but it is atmospheric. There are few visitors and fewer mourners, the majority of plots having been ceded in perpetuity a century or so ago. Today the tombs are monuments to forgotten families, people who were born in a village and died in a city - without ever having moved home. If there are few visitors it is perhaps due to a lack of celebrity residents. In cemeteries - like everywhere else - people want stars, but here everyone is anonymous. Look carefully though and you'll find plenty of stories, as the Pieton de Paris points out. Walking into these small, empty cemeteries armed with a camera always invites distrust. A rather bored attendant wanders out of his office when he spots me and proceeds to follow me down the main path. Later I spot him telling off a gloomy youth who was simply sitting on the floor and sketching a tomb. I'm never too sure what we can or cannot do in Parisian cemeteries, but I'm sure there's an incredibly long and detailed notice pasted up on a wall listing all the bylaws. I'll have to read it sometime. Rules are nothing new here though. This sign is telling local traders not to come and steal the cemetery's water! The existence of such a sign must indicate that the practice was quite common at some point. Weather-worn, aged and uncared for, the monumental tombs have come to resemble the tree trunks they stand alongside. If there are few people in the cemetery, there are - as usual - many animals. In one corner there is a curious community, a shanty town of dog kennels, but none of the résidents were there when I passed by. Protected from the wind and rain by tarpaulin sheets these are obviously year-round residencies, but it's not clear who actually lives here or who looks after them. Pigeons are never far away, their irascible cooing and the hurried flapping of their wings sometimes the only sounds you can hear. The cemetery is edged on one side by a raised concrete walkway. Cut into the wall at regular intervals are viewpoints to the other side, windows to the dead or for the dead. Children race past these windows on bicycles and scooters, screaming with the joys of life. In many ways the cemetery seems anachronistic in this setting, as if death has no role to play in this rapidly changing and modern part of the city. As all around it changes, will the cemetery itself one day be forced into new dress? Thank you for this! I have been to the other cemeteries you mentioned and never heard of this one. For some reason cemeteries are my favorite places to photograph. Actually, there is more than one reason - they are beautiful, interesting, solemn, historical, to name just a few. 2) what is the tall rounded construction in the last photo? Nikki: Thanks for your comment. Yes, cemeteries are very photogenic, but if you go to this one, make sure you hide your camera until you're out of sight of the caretaker! Terry: I was perhaps a little unfair with the cat. He was quite friendly too. As far as I can work out the building is part of the Living School - quite an ironic or mocking name for an institution overlooking a cemetery! It's "Le" cimetière, not "la" ! Pigalle: the battle is lost, but who won the war?